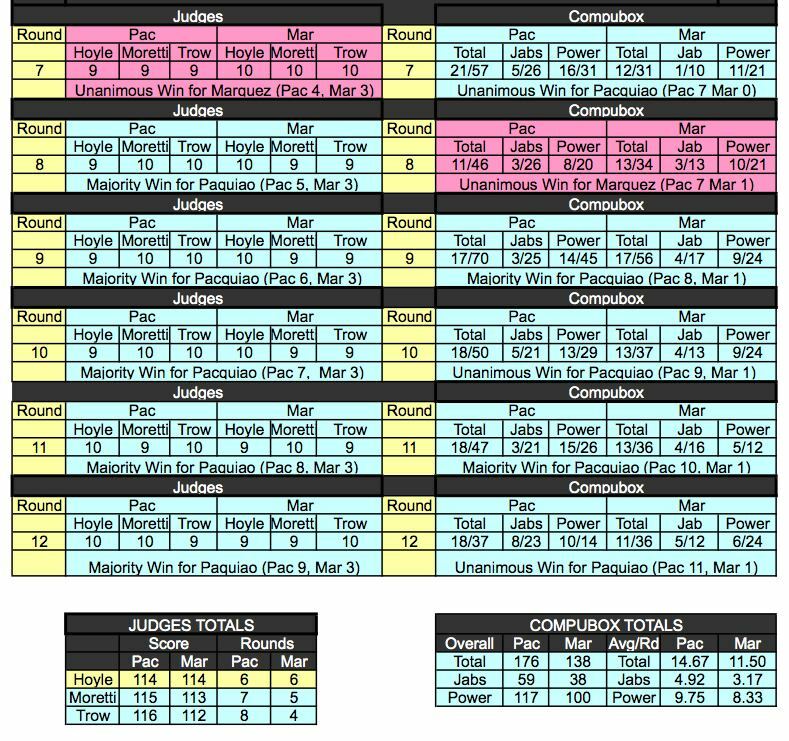 With the controversy over Manny Pacquiao’s majority decision victory over Juan Manuel Marquez not going away any time soon, it’s time to get out the round by round scorecards, and the round by round Compubox stats, and start doing some detailed analysis to understand what the judges saw, what Compubox saw — and why both of these don’t seem to support the “We were robbed” outcry coming from the Marquez camp — an outcry which is being echoed by a lot of writers, observers, and even Pacquiao fans (some of them). Below is a chart which tries to provide some perspective. It shows each round of the fight, with the judges scorecards on the left, and Compubox figures on the right. Rounds won by Pacquiao are in shaded blue; rounds won by Marquez are shaded red(ish). The judges had three round unanimously for Pacquiao, three unanimously for Marquez. The other six rounds were all graded 2-1 in favor of Pacquiao. 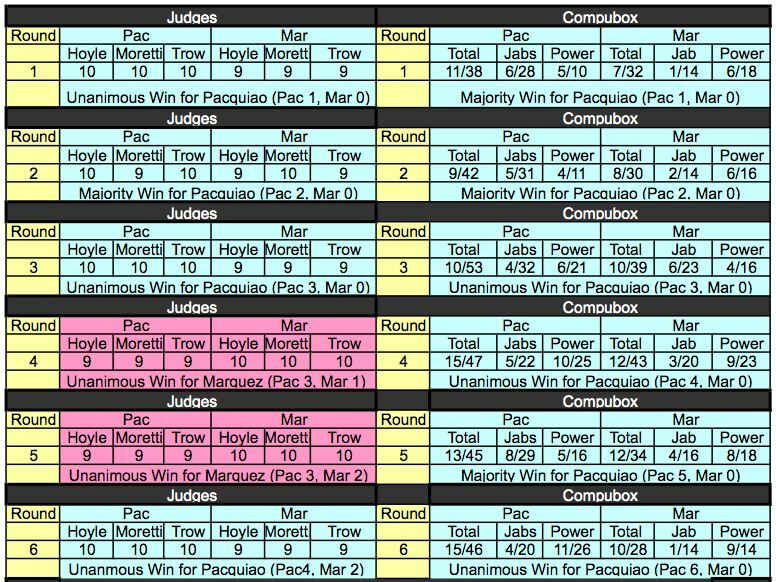 In other words, if you look at each round as a mini-fight all by itself, Pac won 9 rounds from the judges, Marquez 3. Looking at compubox figures, Pacquiao won 11 out of 12 rounds. One inference to draw from this is the judges were in fact giving Marquez credit for cleaner, in some cases harder, punches — that’s why the scores were as close as they were. But this was not enough in the judges’ minds to overcome Pacquiao’s aggression, his higher punch output, and his high landed punch totals. I will have more to say about this later, after I view the fight again, but I wanted to get these charts out there now so people can see them and contemplate them.